Chakras are wheels of energy that exist within our subtle bodies. We all possess seven chakras that start from the top of the head to the base of the spine. These chakras are believed to heavily influence our emotional, physical and spiritual well-being. A healthy person maintains an even flow of energy between all seven chakras. An unhealthy person, however, may have one chakra that emits or utilizes more energy than the rest, resulting in feelings of uneasiness, pain or even disease. The concept of the chakra system dates back to centuries ago. Many Eastern philosophies revolve around this theory of energy centers within the body that control our health. In fact, many Eastern cultures believe that essential oils are capable of balancing these chakras, especially when used alongside other forms of natural medicine such as massage, acupuncture and reiki. According to these Eastern philosophies, every chakra vibrates at a unique frequency. When one chakra is working too hard or becomes weakened by a traumatic event, the frequency at which the chakra vibrates falls out of whack. Essential oils come from living organisms that vibrate at their own unique frequencies. 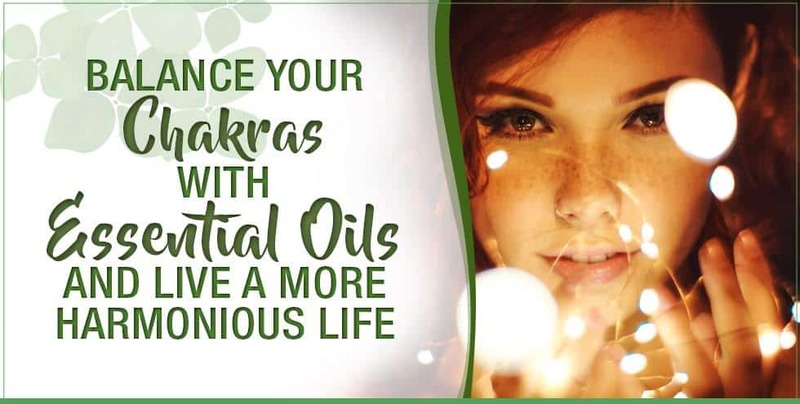 Therefore, by applying the proper essential oils to each chakra, you can restore your natural sense of balance by correcting each chakra’s frequency. To use essential oils to balance your chakras, you can apply a few diluted drops of specific oils to the area in which the chakra is contained. 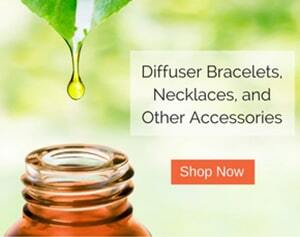 You can also diffuse these specific oils around the home. Located at the base of the spine, the root chakra determines how connected we feel to the world. When our root chakra is healthy, we feel grounded. We also feel a sense of oneness with the universe. A depleted root chakra leaves us feeling uncertain of our place in the world. We may feel insecure about financial issues. Meanwhile, a root chakra that contains too much energy will cause us to lose our connection to our spiritual selves. Signs of an unhealthy root chakra include foot and knee pain. 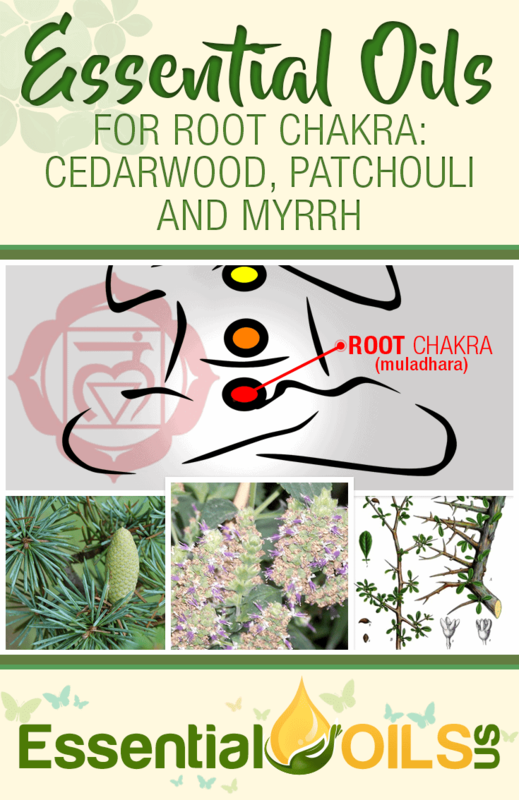 To balance the root chakra, you can use cedarwood, patchouli and myrrh essential oils. The sacral chakra, located in the lower abdomen, is commonly associated with our sexuality. It relates to our ability to feel pleasure. It’s also a big source of creativity. A depleted sacral chakra can leave us feeling incapable of experiencing pleasure. It can also make us feel sexually insecure. An overabundance of energy in the sacral chakra will cause us to chase pleasure regardless of the consequences. It can also result in sexual addiction. 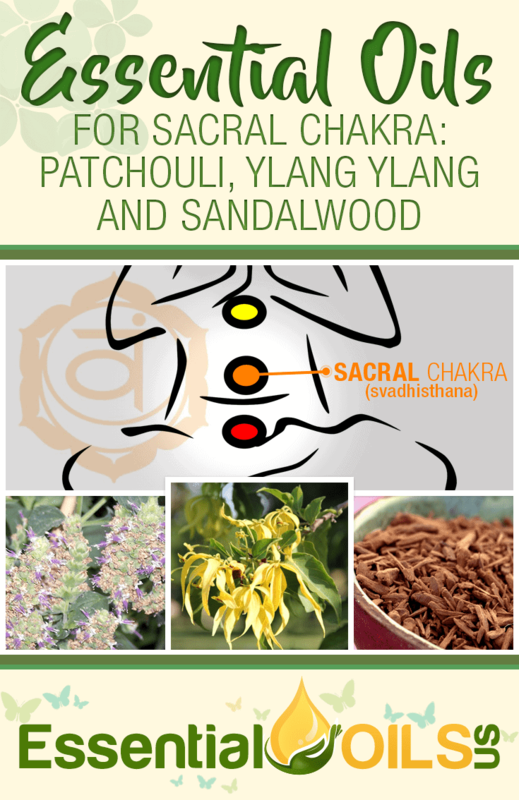 Essential oils that balance your sacral chakra include patchouli, ylang ylang and sanalwood. Our self-esteem exists within the solar plexus chakra. Located in the stomach, this chakra is where we store feelings related to the way in which we perceive ourselves. If the solar plexus chakra is depleted of energy, we may find ourselves feeling insecure and unworthy. A solar plexus that has too much energy will cause us to feel invincible, blocking us from our ability to accept wisdom from those around us. It can also cause us to become selfish. Symptoms of an imbalanced solar plexus chakra include stomach ulcers and other digestive troubles. 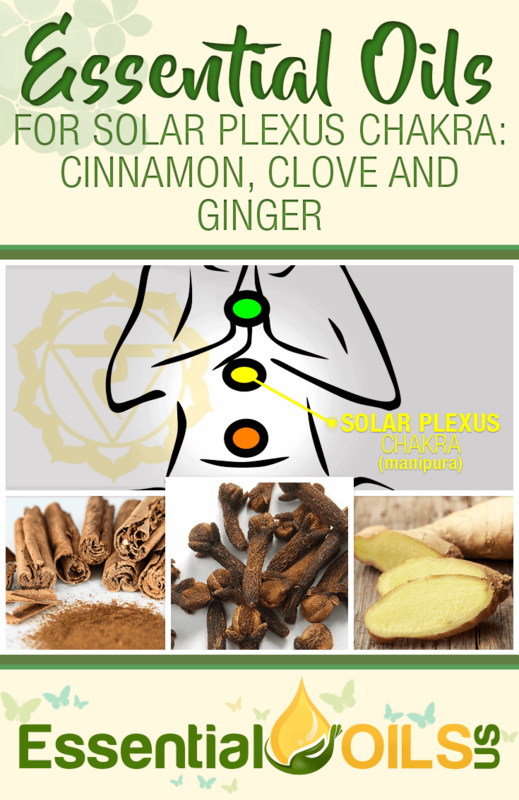 To heal your solar plexus chakra, you can use cinnamon, clove and ginger essential oils. Unsurprisingly, the heart chakra represents love. When our heart chakra is in good health, we give and receive love with ease. We find the ability to love all people and things. And, we accept love without fear of rejection or jealousy. When the heart chakra is depleted of energy, we may feel jealous, unloved and possessive. A heart chakra that has too much energy may cause us to smother others and pursue romantic relationships that aren’t healthy for our souls. 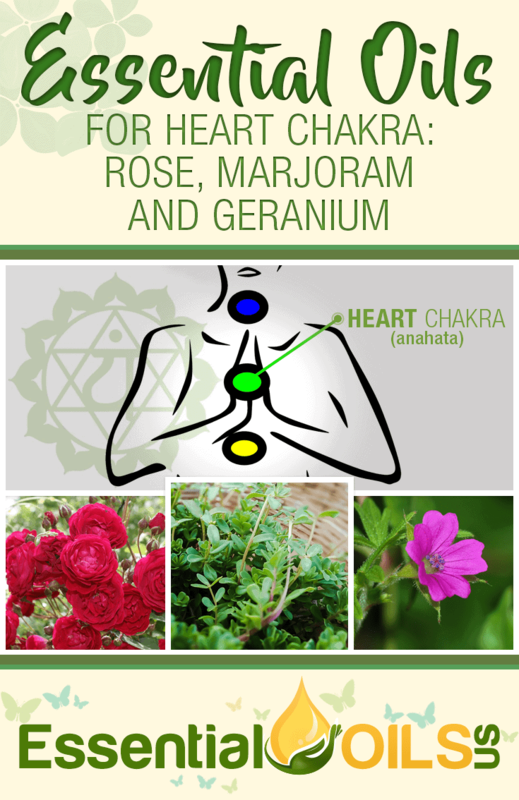 To balance your heart chakra’s energy, you can use rose, marjoram and geranium essential oils. The throat chakra represents our ability to communicate with others and with the world around us. When our throat chakra is functioning properly, we can easily express ourselves to others without feeling afraid of what others may think. We also have the ability to communicate our needs to others, ensuring healthy and fulfilling relationships. If our throat chakra is working overtime, we may find ourselves speaking without any regard for how others may feel. We may also find ourselves expressing ourselves without taking the time to listen to others. A throat chakra that is depleted will result in a fear of stating our needs and feelings to others. 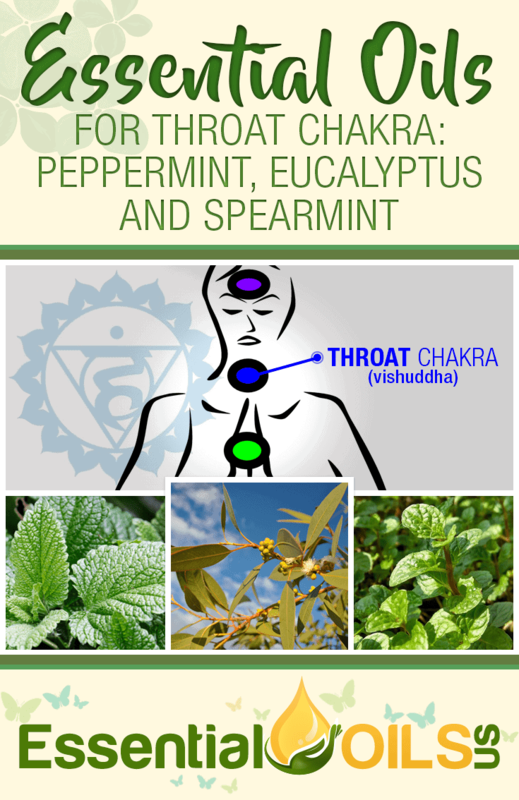 To restore the health of your throat chakra, you can turn to peppermint, eucalyptus and spearmint essential oils. The third eye chakra holds the key to our natural intuition. A healthy third eye chakra gives us the ability to see the world around us in a clear way. It also gives us the ability to make decisions that are in the best interest of our emotional, physical and spiritual selves. When the third eye chakra is depleted, we may feel anxiety, uncertainty and apprehension about the future. When the third eye chakra is working too hard, we may become arrogant and out of touch with reality. 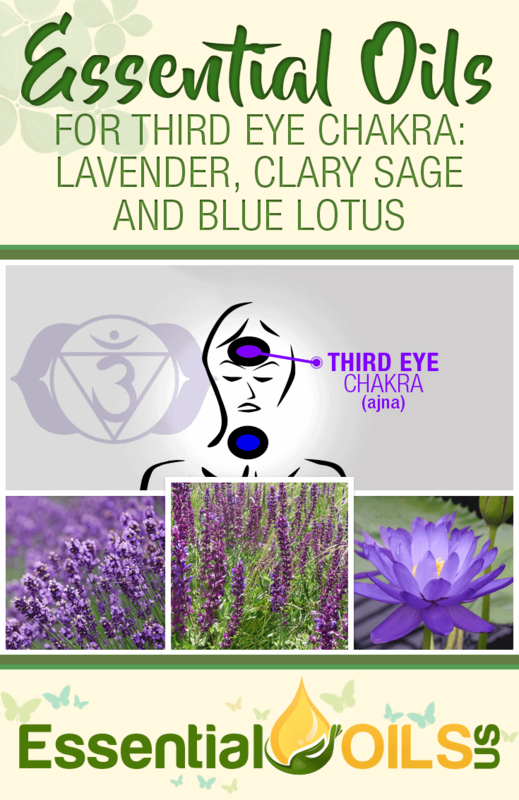 Essential oils that regulate the third eye chakra include lavender, clary sage and blue lotus. The crown chakra represents our spiritual existence and our connection to a higher power. When this chakra contains too much energy, we may be out of touch with our physical bodies. We may also feel ungrounded. When our crown chakra is depleted of energy, we lose the connection to the higher energetic field that unites all living things. Symptoms of an unhealthy crown chakra include depression, hypersensitivity and dizziness. 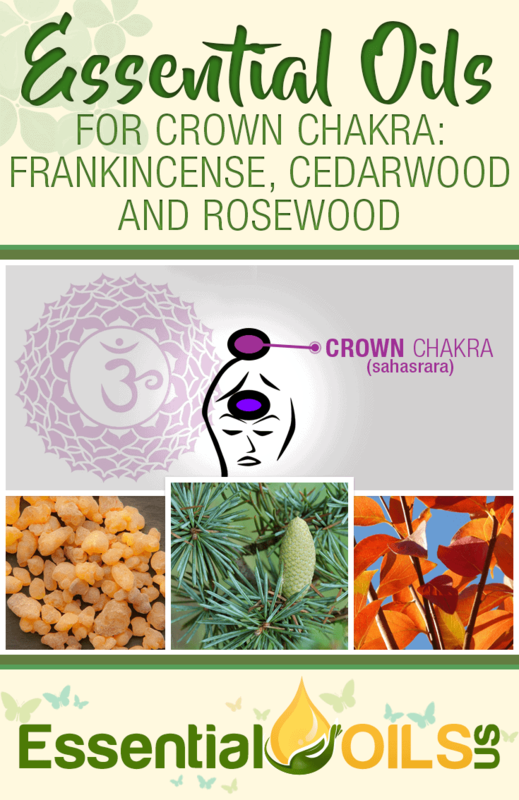 Essential oils that restore the crown chakra include frankincense, cedarwood and rosewood. Ancient Eastern medicine teaches us that a balanced chakra system will lead to good health on an emotional, physical and spiritual level. Therefore, by using these essential oils to treat an imbalance of energy throughout the chakra system, you’ll feel a sense of harmony that you haven’t felt in a long time.